Zippy is a happy, exuberant puppy who loves life and everyone in it. This sweet little girl with the happy tail is wonderful with other dogs as long as they do not overwhelm her, and would probably love to have a canine buddy to play with. She is cat safe. Zippy is kennel trained and is quiet and well behaved. Would Zippy be ok with a cat and two Chihuahuas? Will Ziggy be at the adoption fair on the 19th? How much is Ziggy to adopt? I believe Zippy has found a forever home. 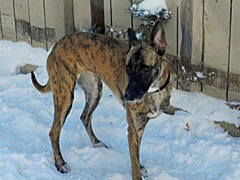 Contact Micheala at 204.219.4029 to discuss other available hounds.